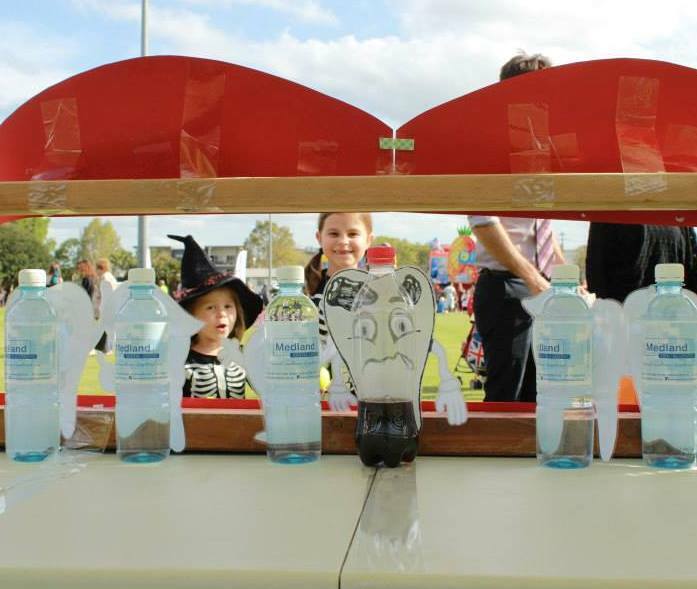 This year Medland Dental Centre and took part in ‘Hocus Pocus in the Park’, a Halloween community event organised by Bulimba Business. Held in the busy Oxford Memorial Park on Oxford Street Bulimba, the free event came to fruition last year to make Halloween safer and more enjoyable for local children. Local businesses held Trick or Treat stalls; and there was a disco, a sausage sizzle and lots of great costumes. We were asked to present a more health conscious dental message in what is often a very sugary occasion! It was a great day and we were pleasantly surprised by the community’s interest in our healthy message. Check out more photos of the event on our Facebook Page and see our Medlands Kids Club Team for the day – Dr Stephanie Shields (A.K.A the Tooth Fairy), Dr Ian Morrison, Shannon Zerner and Erica! Our Sugar Free Fun stall and Spot the Rotten Tooth ball game were very popular with the children. Even better, our Treat bags contained delicious sugarless lollipops made out of Xylitol. Many parents were particularly interested in the lollipops made from Xylitol, which is a natural sweetener derived from the birch tree. Research has also shown that Xylitol inhibits the growth of plaque (decay causing bacteria), increases salivary flow and increases fluoride penetration into the teeth. Therefore it actually strengthens the teeth against decay and promotes the reversal of the initial stages of decay! The sugar-free Xylitol lollipops we distributed were produced by Dr John, a company founded by an American dentist, Dr John Bruinsma and his wife, Debra, a dental hygienist. For more information about the health benefits of Xylitol see their website. If you would like information on how to obtain sugar free Xylitol lollies, please contact us on info@medlanddental.com.au. Stay tuned to your Kids Club Newsletters for more upcoming local and community events.